The once proud Customs Service is now nothing more that a shell of what it previously was, there are now no staff employed on the Island. The Watch House, a Customs office since the early 18th Century, has been sold to the RNLI. I have worked on and off for 25 years as a Customs Officer at Cowes on the Isle of Wight. Whilst I was a Cowes I had the opportunity to extract details from some of the historic records which were held at the Cowes office, fortunately some of these have now been returned to the Island and are held by the Isle of Wight Records Office, and it is hoped that others will be transferred to the National Archives. I am now also transcribing extracts from records (mainly Letters Books) held at the National Archives and Isle of Wight Records Office, but this will be a long job. I am also attempting to compile a list of officers who have served on the Isle of Wight, which also includes Excise Officers, although most of these records do not appear to have survived, and Coast Guard Officers until about 1830. I have recently added a list of Prosecutions from 1751 to 1860. Most records post 1925 have not yet been released as the result of privacy considerations, so I only have very limited information about staffing after that date. Unfortunately I have not been able to spend a great deal of time on this site in recent year, but am currently in the process of checking links and generally updating it. This is at present a trial search which it is hoped will be of assistance. Updates do not appear to be included for some time after download. If you don't find what you're looking for, please continue browsing the site for it. A short history of Cowes Customs. Cowes in the News Newspaper Extracts about Customs at Cowes, also includes some Excise and Coastguard. From Cowes Record Books - This includes transcriptions of extracts from Collector to Board Letters Books, now held in the National Archives, which give insights into the way Cowes Customs operated. Customs Staff 1821 - 1830 - transcription from the Oaths of Admission book held at the National Archives. Cowes staff 1839 - 1922 - transcription from the Ages and conditions book held at the National Archives. The wreck of the Varvassi off the Needles, 1947 including Customs reports. Customs Gallery - a limited range of pictures of Customs Officers and property on the Island. This book detailed investigations into alleged misdemeanours by Customs Officers at Cowes. 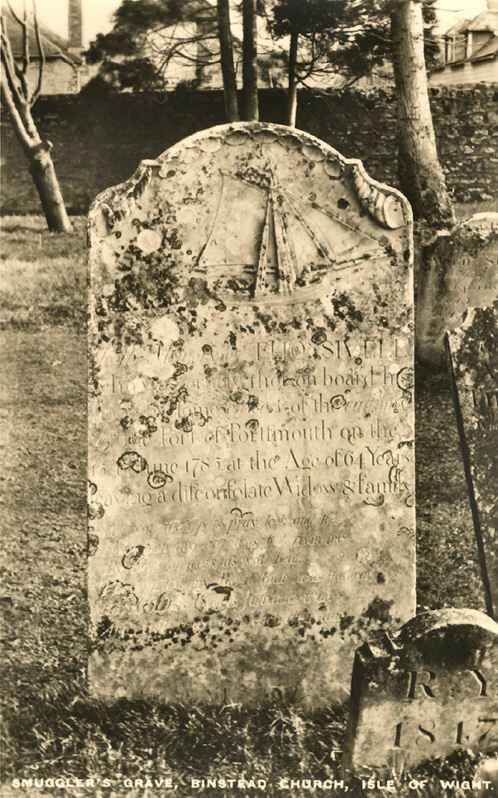 To the memory of THOs SIVELL who was cruely fhot on board his floop by fome officers of customs of the Port of Portfmouth on the 15th June 1785 at the age of 64 years leaving a difconfolate widow & family. This is not the only case of an allegedly innocent person being killed by Customs. 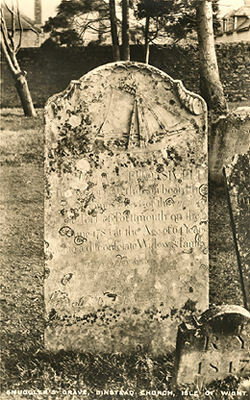 Sacred to the memory of Richard Matthews who died 5th December 1816. Note: These pages are my transcriptions of original documents, they are accurate to the best of my ability but I do not take any responsibility for errors. 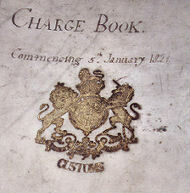 This page predominantly contains Customs records, but have included Excise records where available. Unfortunately these do not appear to have been preserved in the same way as Customs records.